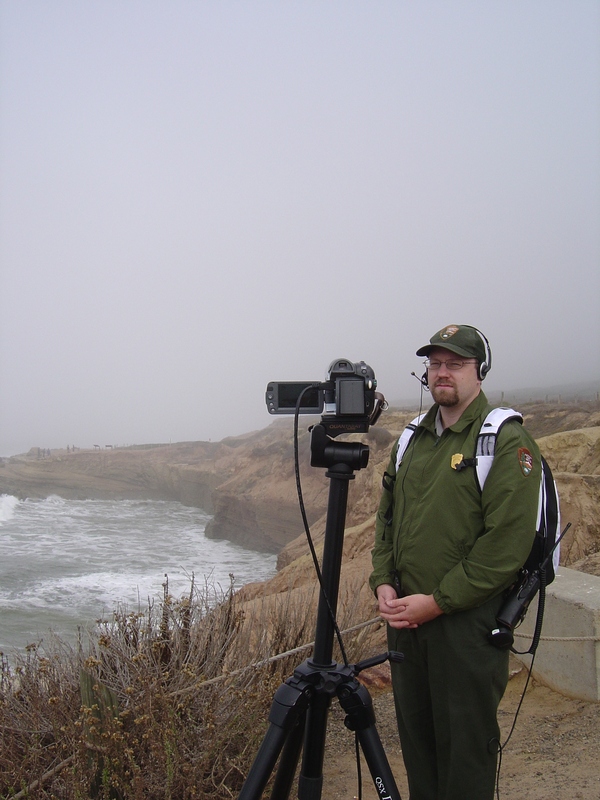 On December 1, Mountain Empire Middle School science students participated in "Ocean Terracing LIVE" with Marine Biologist Benjamin Pister at the Cabrillo National Monument intertidal area. Dr. Pister shared information regarding ocean terracing and then fielded an array of questions posed by the middle school students. The setup at the Cabrillo end consisted of the HPWREN/StSS LIVE backpack as well as a tripod while the setup at the Mountain Empire end included a Macintosh laptop connected to a projector. The LIVE session utilized Skype as the communication tool for both audio and video, which were solid throughout the session. 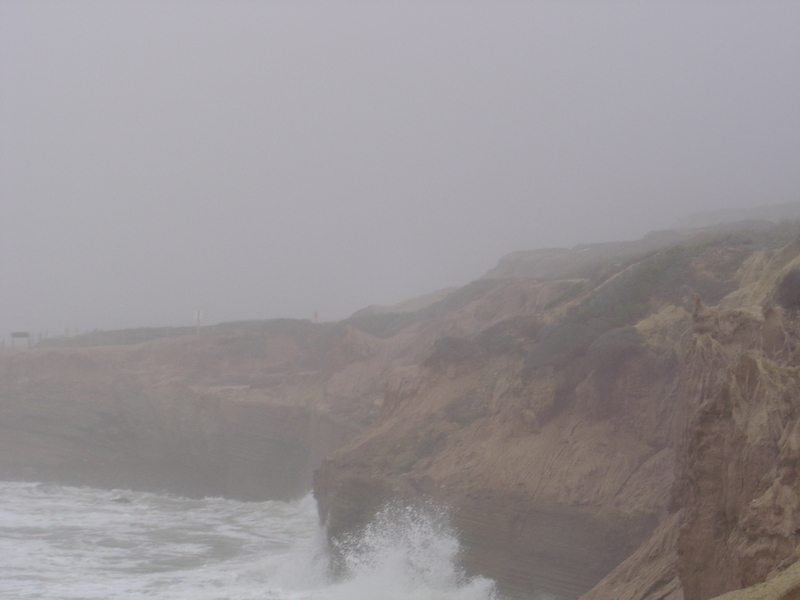 Although the fog prevented clear vision of the details at the coast, the weather allowed students at the education site to better understand the variation between inland and coastal weather conditions. The December 1 activity allowed participants to catch a glimpse of the intense morning fog frequently seen at the intertidal area during the winter months. "The students were very interested in how our weather conditions in the inland valley were so different from those along the coast," said Mountain Empire School Science Teacher Roger Wynn. "Even though we are only about 60 miles away, the weather variations can be extreme." "It was Benjamin's great real-time interaction with the students, along with the inclimate weather at the science site, that made the students very interested in not only experiencing the intertidal area at Cabrillo via LIVE, but making it feasible for them to visit the intertidal area - either by a weekday school fieldtrip or with their families on the weekends." Top: Jim Hale (HPWREN) and Susan Teel (StSS) setup and test the equipment used for the "Ocean Terracing LIVE" activity between Cabrillo's intertidal area and the Mountain Empire Middle School. Right: Cabrillo Marine Biologist Benjamin Pister listens intently while Mountain Empire Middle School science students ask real-time questions about ocean terracing at Point Loma's intertidal area. "What I found interesting is that I found out what a terrace was. I would like to learn more about where are the most terraces and do any animals live in the terraces. One suggestion to make the field experience better is if we could visit the terraces." "What I found interesting is that we got to see the beach. I would like to actually get there." "We got to see the fog, all the fossils we saw on the ground were interesting. We need to get there and see everything. We need to actually go there." "We got to see the terraces and fossils that are in the cliffs. We should go in the water and look under water at the terrace." "What I found interesting was that it was live and we got to ask questions about the terraces which are cool. One suggestion to make the field experience better is actually going to the beach so we can view it better and it's more fun." "I found the backpack interesting, but what kind of creatures live on the ocean floor. And actually going there is better." "It was so realistic I felt like I was there. If people use to live around there I would like to know more about that. I would like to have our own computer with a webcam instead of looking up front of the room." "I liked when we learned about the tidepools and how they worked when we got to learn about the details and important things about the tidepools and we got a good footage. I would like to know more about the terraces. To actually try going to the field trip and go there to experience it ourselves and not do the computer thing." "I thought the field trip was cool because I learned more about terraces and how they are made and how long it took for them to fully develop. I would want to learn more about the terraces and actually go there and not on web cam." "What I found interesting about yesterday's field trip was how old the terrace can get. What I would like to know more about is the new terraces forming. One suggestion to make the field experience better is going there."